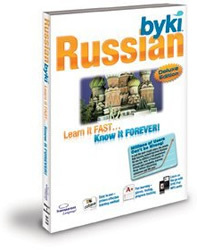 BYKI Russian made the process of learning the Russian language enjoyable and fast. It is both efficient and effective in its goal. Russian is a "high gratitude" language producing vigorous sounds that feel very pleasant as you speak the words and Russian BYKI Deluxe does a good job of imparting this to the student. No wonder it is one of the more popular methods out in the market today and also the reason why I chose it over other systems. To anyone who wants to learn the Russian language, you have to take note of several very essential things. First, Russian uses a different alphabet, the Cyrillic alphabet, that you must need to assimilate into your memory; Second, in Russian there are some sounds that could be hard, or at least not too familiar, for a non-native Russian speaker; and Third, the very different and complex grammar. You might recognize some vocabulary, but mostly, it will be alien to those who are just starting out to learn this language. These characteristics made the Russian language more difficult to learn than others, but with the help of BYKI Russian, the difficulty became bearable and allowed for studying at a pace I was comfortable with. Russian BYKI Deluxe is actually a very simple program employing a flash card system and repetition, but not the random and redundant kind of repetition. With its ability to track your progress, it detected the materials that I was finding difficult to assimilate and made you focus on these until the time I was able to identify them with ease. It even gives me the ability to print flip cards of the words I had difficulty in learning so I can try to remember these words throughout the day. This makes it possible to go on learning as you are spending your time at work. BYKI Russian Deluxe effectively combines the rote learning style you get from textbooks and the intuitive learning style from more expensive language software. At first, it did not seem like I was learning anything, but after a little time, I realized that I was answering questions and speaking in the Russian language. After purchase the software is downloadable from the developer website, for both Windows and Mac. It includes over 75 more lists of words and phrases drawn from common conversational situations with images or visual cues available for all flash cards and I was also able to create my own customized word and phrase lists that helped me further focus on the materials that I felt most important. Another very useful benefit I got from BYKI Russian was the advanced pronunciation practice, which allowed me to record my own voice and compare this with the audio of native speakers, thus allowing me to identify the correct manner of speaking there and then. BYKI Russian Deluxe is an excellent application for its purpose, but as with everything, it is not perfect. First, the interface, although user friendly and neat, could be more polished or attractive; another is that it does not include much advanced content, although it has enough to get beginners through common usage of the language. For its price of $69, which is much lower than the price of its competitors, you get good value and the learning experience is almost as good as that from more expensive products. It makes up for its few flaws with its customizability and ability to track your progress. Other good things about Russian BYKI Deluxe are that it is very easy to download, install and run and it has a very small footprint compared to other software in its class.